The Bengali Language Movement which gave birth to the incident of 21st February in 1952, known popularly as Ekushey, sixty six years ago was a socio-political-cultural attempt in the then East Pakistan advocating for the recognition of the Bengali language as an official language of Pakistan. Both the wings (East Pakistan, also called East Bengal and West Pakistan) of the state of Pakistan after its inception in 1947 were wide apart, split along cultural, geographical and linguistic lines. In 1948, the government of Pakistan ordained Urdu as the sole national language, sparking extensive protests among the Bengali-speaking majority in East Pakistan. Facing rising sectarian tensions and mass discontent, the government banned public meetings and rallies. The students of the Dhaka University and other political activists defied the law and organised a protest on February 21, 1952. The movement reached its climax when police killed student demonstrators on that day. The deaths provoked widespread civil unrest. After years of conflict, the central government relented and granted official status to the Bengali language in 1956. In 2000, UNESCO declared February 21 the International Mother Language Day as a tribute to the language movement and the ethno-linguistic rights of people around the world. The language movement catalysed the assertion of Bengali national identity in the then Pakistan, and became a forerunner to Bengali nationalist movements, including the growing awareness of self rule in 1954 general election, student movement in 1962, 6-point movement, uprising in 1969 and finally, the Bangladesh Liberation War in 1971. The supreme sacrifice of the martyrs of the language movement on February 21, 1952 became an epitome of self consciousness and self dignity of the people of the region as a nation. It resulted in bringing about the only nation state in the globe which is named after its language -- Bangla. Bengali-speaking people in East Pakistan made up 44 million of the newly formed Pakistan's 69 million people in 1947. The Pakistani administration, its civil service and the military were dominated by West Pakistanis. In October, 1947, a key resolution at a national education summit in Karachi advocated Urdu as the sole state language of Pakistan. Opposition and protests immediately arose. Students from Dhaka rallied under the leadership of Abul Kashem (1920-1991), the secretary of Tamaddun Majlish, a Bengali Islamic cultural organisation. The meeting demanded Bengali as an official language of Pakistan and as a medium of education in East Pakistan. But the Pakistan Public Service Commission removed Bengali from the list of approved subjects as well as from currency notes and stamps. The central education minister of Pakistan made extensive preparations to make Urdu the only state language of Pakistan. Public outrage spread, and a large number of Bengali students met around the campus of the University of Dhaka on December 8, 1947 to formally demand that Bengali be made an official language. To promote their cause, Bengali students organised processions and rallies in Dhaka. It was not an instantly sparked movement. The demand and the protest had a long historical backup. The mother tongue of the people of Bengal particularly of the Muslims traces back to the seventeenth century, as documented in the poems of Abdul Hakim (1620-1690) of Swandwip, Noakhali. The seventeenth century bard was not hesitant to mention, if not condemn those who were born in Bengal but hated Bangla. From the mid-19th century, Urdu had been promoted as the lingua franca of the Indian Muslims by political and religious leaders. Khanbahadur Ahsanullah (1873-1965), an educationist and social reformer, pronounced strongly in 1918 in one of his oration (The Bengali language and the Literature of the Muslims) that one must respect Bangla and recognise its primacy over other languages like Urdu etc. Ahsanullah made this observation in the wake of attempts of contemporary intelligentsia to establish Urdu as the lingua franca of Muslims in Bengal. As early as in the late 19th century, social activists such as the Muslim feminist Rokeya Sakhawat Hussain (1880-1932) chose to write in Bengali to reach out to the people and develop it as a modern language. Exactly twenty five years before February 1952, two papers were presented on the second day of the two-day Annual Literary Conference (February 27-28, 1927) of the Muslim Shahittya Shamaj on the appropriateness in the use of Bangla in Muslim society. Kazi Nazrul Islam (1899-1976), the most revered rebel poet, inaugurated the conference. Abul Hussain (1896-1938), the Secretary and one of the founders of the Shaittya Shamaj, in his paper put forward that lack of access to mother language has been the major obstacle in the way of social development of the Muslim community in Bengal. Leading Bengali scholars argued why only Urdu should be the state language. The renowned linguist Muhammad Shahidullah (1885-1969) pointed out that Urdu was not the native language of any part of Pakistan, and said, "If we have to choose a second state language, we should consider Urdu." The prolific writer Abul Mansur Ahmed (1897-1079) said if Urdu became the state language, the educated society of East Pakistan would become 'illiterate' and 'ineligible' for government positions. The first Rastrabhasa Sangram Parishad (National Language Action Committee), an organisation in favour of Bengali as a state language was formed towards the end of December 1947. Professor Nurul Huq Bhuiyan of the Tamaddun Majlish convened the committee. Later, Parliament member Shamsul Huq convened a new committee to push for Bengali as a state language. Dhirendranath Datta (1886-1971), a member of the East Bengal Provincial Assembly proposed legislation in the Constituent Assembly of Pakistan to allow members to speak in Bengali in Parliament and authorise its use for official purposes. Datta's proposal was supported by several legislators of East Bengal. Prime Minister Liaquat Ali Khan and the Muslim League denounced the proposal as an attempt to divide the Pakistani people, and thus Dutta's proposal got turned down. On March11, 1948 students of Dhaka University and colleges of the city organised a general strike to protest the omission of Bengali language from official use, including in coins, stamps and recruitment tests for the Navy. The movement restated the demand that Bengali be declared an official language of Pakistan. At the height of civic unrest, Governor-General of Pakistan Muhammad Ali Jinnah (1876-1948) arrived in Dhaka on March 19, 1948. On March 21, at a civic reception at the Racecourse Ground, he claimed that the language issue was designed by a "fifth column" to divide Pakistani Muslims. Jinnah further declared that "Urdu, and only Urdu" embodied the spirit of the Muslims and would remain as the state language. The Urdu-Bengali controversy was reignited when Jinnah's successor, governor-general Khawaja Nazimuddin, staunchly defended the "Urdu-only" policy in a speech on January 27, 1952. On January 31, the Shorbodolio Kendrio Rashtrobhasha Kormi Porishod (All-Party Central Language Action Committee) was formed in a meeting at the Bar Library Hall of Dhaka University, chaired by Maulana Bhashani (1880-1976). The Action Committee called for an all out protest on February 21, including strikes and rallies. Students of Dhaka University and other institutions gathered at the university premises on February 4 and insisted on the recognition of Bengali. As preparation for the demonstration was going on, the government imposed Section 144 in the city of Dhaka, thereby banning any gatherings of more than four people at a time. The language movement laid not only the foundation for ethnic nationalism among the Bengalis of East Pakistan, it also brought to light the cultural differences between the two wings of Pakistan. 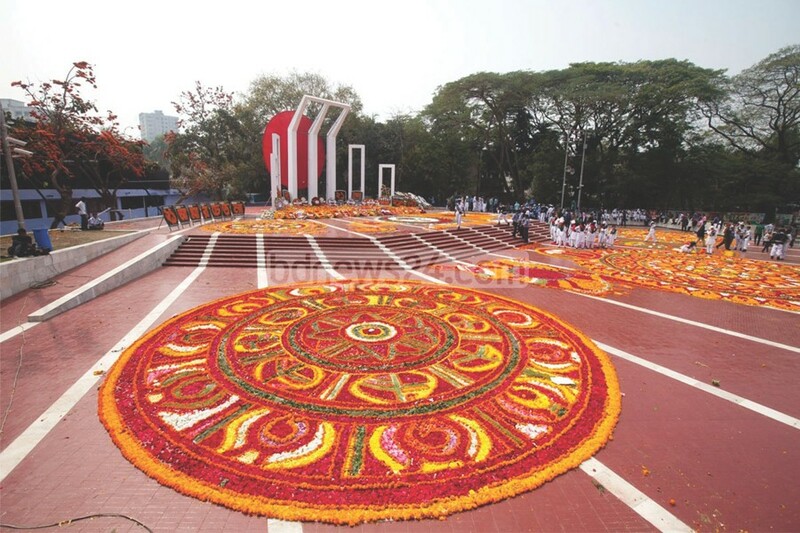 In fact, the Ekushey played an important role in making the Bengali people aware of their cultural and national heritage that ultimately led to the creation of Bangladesh in 1971. After 1971, even today, Ekushey is a guiding philosophy for any movement against oppression, injustice, disparity and denial of civic rights. Dr Muhammad Abdul Mazid, former Secretary to the Government and Chairman, NBR.